Lineage. Constituted as 45 Aeromedical Evacuation Squadron on 18 Feb 1959. Activated in the Reserve on 14 Apr 1959. Inactivated on 1 Mar 1970. Consolidated (1 Nov 1990) with the 45 Aeromedical Evacuation Flight, which was constituted on 7 Jan 1970. Activated in the Reserve on 1 Mar 1970. 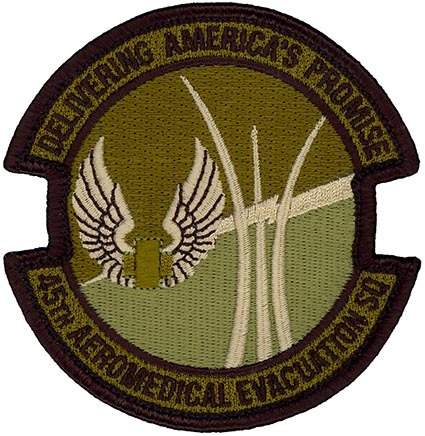 Consolidated unit designated 45 Aeromedical Evacuation Squadron. Inactivated on 1 Oct 1994. Activated on 1 Oct 2008. Assignments. 4 Aeromedical Evacuation Group, 14 Apr 1959 (attached to 2653 Air Reserve Center, 14 Apr 1959-Jul 1960); 936 Military Airlift Group, 1 Jan 1967-1 Mar 1970. 936 Military Airlift (later, 936 Tactical Airlift) Group, 1 Mar 1970; 927 Tactical Airlift (later, 927 Airlift; 927 Air Refueling) Group, 1 Mar 1972; 927 Operations Group, 1 Aug 1992-1 Oct 1994. 927 Operations Group, 1 Oct 2008-. Stations. Richards-Gebaur AFB, 14 Apr 1959; Selfridge AFB, MI, 8 Jan 1961-1 Mar 1970. Selfridge AFB (later, Selfridge ANG Base), MI, 1 Mar 1970-1 Oct 1994. MacDill AFB, FL, 1 Oct 2008-. Operations. Provide theater-level command and control for all aeromedical evacuation activities supporting the Worldwide Aeromedical Evacuation System. Decorations. Air Force Outstanding Unit Award: 1 Nov 1978-31 Oct 1980. Emblem. Approved 15 Sep 2008.